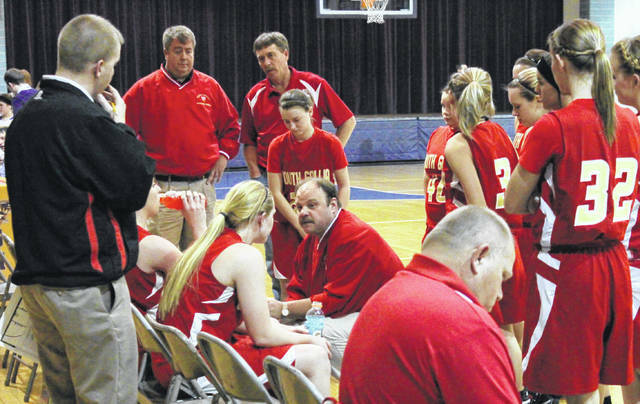 Former South Gallia girls basketball coach Brett Bostic, kneeling in center, talks with his troops during a January 3, 2013, contest against Southern in Racine, Ohio. Bostic was named the varsity boys basketball coach at River Valley on Wednesday night. BIDWELL, Ohio — Back in black … and silver. After a four-year hiatus from the head coaching ranks, Brett Bostic is once again returning to the sidelines for a Gallia County-based program after being unanimously approved on Wednesday night as the next varsity boys basketball coach at River Valley High School. Bostic — who has served as a varsity boys assistant at Gallia Academy over the past four seasons and has well over 20 years of coaching experience — inherits a program that has gone through three different head coaches over the past five years, as well as not winning a sectional title since the 1999 campaign. Bostic previously has head coaching experience at South Gallia, where he led the Lady Rebels to three sectional titles and a district finals appearance in 2013 during his nine-year tenure with the Red and Gold. Bostic accumulated 124 wins as the SGHS girls coach from 2006 until 2014, which serves as tops in that program’s history. Bostic was also named the Division IV Southeast District coach of the year by the Associated Press in his next-to-last season at South Gallia. It’s a different game in terms of speed, leading boys instead of girls, but Bostic admits that the opportunity ultimately ended up being too much to walk away from. “When the opportunity presented itself, I did some looking into it with people I knew around the area — including people within the River Valley district already. After weighing everything, I just thought it was a good fit because of the people that were already there who could help be part of what we’d be trying to do,” Bostic said. “Having Lynn Sheets already in the building as a varsity assistant was a huge draw, plus it’s a good fit with my regular job in the city. I think we as a staff and the administration at River Valley both have the same ideas of where we want the program to be, so I just felt like this was the time to make the move. Bostic’s approach, at least at South Gallia, was to build the program up through group work, relying on at least eight players for contributions on any given night. Some will contribute more than others, but it was the depth that allowed his Lady Rebel squads to gradually grow into a consistently tough-out for any opponent. The group mentality is something that Bostic wants to continue during his tenure with the Silver and Black, but it will take a lot of effort early on to make that transition a successful one. RVHS athletic director Richard Stephens feels that bringing in Bostic is not only a good hire for the school in the here-and-now, but also in moving forward — something hopefully more permanent than another two-year cycle. “Coach Bostic has coached basketball in Gallia County for years, and he has coached with some excellent coaches — as well as being a very successful head coach at South Gallia,” Stephens said. “We are very excited about the opportunities that he brings to the basketball program, and Coach Bostic is eager to get the program turned around and back on track. In being introduced to his future players, Bostic noted that there seemed to be some buzz about him coming on board. As he said, that’s a good thing … primarily because he needs every one of his potential players to be enthusiastic about an entirely different approach. Another key element to this hiring is the relationship between Bostic and River Valley’s new football coach Jason Peck. Both worked at South Gallia in head-coaching capacities at South Gallia, and both understand that you need all of the athletes you can get to be successful every season at a smaller school. Stephens feels that the prior relationship with Peck, as well as having longtime basketball coach Lynn Sheets already in house and on board, will really aid Bostic in his first season at the helm. Bostic — who could have just as easily stayed at Gallia Academy as an assistant for what could be a pretty special varsity boys season — noted that just about everyone has asked him a three-letter question about accepting this position. The answer is pretty much as easy as the question — and the end result could potentially lead to something special in the northern part of Gallia County. The Raiders haven’t had double-digit wins in a season in three years and haven’t posted consecutive 10-win seasons since the 2005-06 and 2006-07 campaigns.